4. 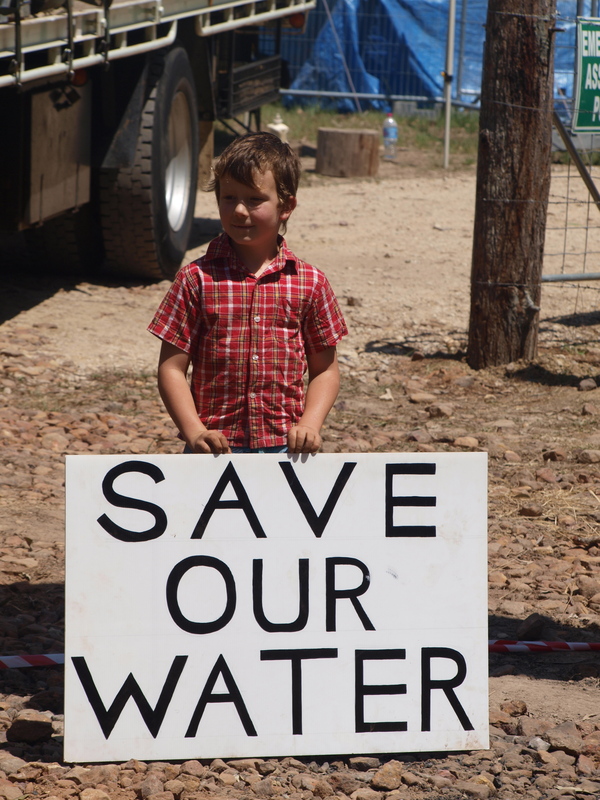 Incidents in recent years such as wastewater overflows in the Pilliga State Forest and at Casino demonstrate that the infant unconventional gas industry is either not willing or not capable of averting such incidents, and that the planning for and granting of exploration licences was probably premature. As a Rous Councillor, I recently asked Rous staff and to confirm whether the Bentley site drains to Leycester Creek and whether that water is hydraulically connected to our Lismore Source? Rous staff responded as follows (italics). “The site is located approximately 750m from Back Creek, located to the north. Back Creek flows east to Leycester Creek. Leycester Creek converges with the Wilsons River within the township of Lismore, approximately 15 km east of the site. The Wilsons River is a tributary to the Richmond River, which confluence approximately 27km south east of the site, within the town of Coraki. Therefore, the answer to your question is yes. The site of the proposed drilling is approximately 15 45 km upstream of the junction of Leycester Creek and the Wilsons River at Lismore. In terms of the Rous Water extraction point for the Wilsons River source, this source draws from the upper reaches of the tidal pool and is therefore subject to the potential upstream movement of water and contaminants as well as impacts originating upstream within the Wilsons River and Coopers Creek catchments. During low flows, Rous Water does not operate this source. Rous Water shall not be operating the source at flows less than the 90th percentile from September to February (during times of high irrigator demand) or less than the 95th percentile from March to August (when irrigation demands are low). During higher flows there would be reduced potential for the upstream movement of contaminants. Downstream water quality risks arise from the discharge of potentially contaminated runoff from Lismore STP, Lismore CDB and the Leycester Creek catchment to the tidal pool, with potential significance for the prevailing water quality at Howards Grass. In considering potential water quality hazards that may arise from the Leycester Creek catchment, a key question to be addressed concerns the extent to which the upstream migration of contaminants could occur. Therefore, a key question to be addressed concerns the extent to which the upstream migration of 20 contaminants occurs during these intermediate flow ranges, when potential exposure could occur. This analysis requires consideration of the variability of tidal flows that would also introduce variability to this situation. With specific reference to Leycester Creek, it was found that adopting conservative assumptions regarding the diffusion of a contaminant, it was found that the “upstream migration of a contaminant at Leycester Creek or Lismore CBD takes 3 days and has been diluted by 2.3 log (99.6%).” All scenarios found that a pollutant discharged into the Wilsons River from Leycester Creek would be diluted by a minimum of 2 log removal (99%). Therefore, the risk of an issue occurring at the subject site and being measurable at the extraction site from the Wilsons River in Lismore needs to consider both the dilution of any contaminant introduced at the subject site and transported downstream to Leycester Creek in Lismore, as well as the 2+ log removal (99%+) or dilution of any such contaminant being transported upstream to the Wilsons River offtake. My view is that the risk to water quality is substantial while the necessity for unconventional gas to 55 be discovered or, if found, extracted in this particular locality is negligible. There is gas elsewhere. “In summary, results of the modelling indicate that under normal operating conditions with would be undermined in that a replacement source would be required almost immediately. While groundwater is proposed as ‘the new source’, it requires several years of investigation prior to use. The second paragraph of the quote above from the REF for the current exploration well at Bentley 5 indicates little or no depth of consideration in stating that “it is unlikely that surface water runoff will have the potential to impact local tributaries”. Too many wastewater ponds have failed. The risk has not been adequately investigated. I believe that if it were, the cost of that risk to the water supplies of the urban populations of four Shires would outweigh the benefit of discovering or 10 extracting gas within the catchment of the water supply source. There are two things that are needed for a better chance of success: resilience and an alternative. This is not a challenge that will be overcome in one blazing encounter, one event or one moment. Most environmental campaigns are not settled like that. Resilience is key: harassing, haranguing, resisting, delaying, agitating, and irritating, these are strategies that often bear fruit. Many campaigns I’ve been involved with have been won due to a dip in share price or the price of gold, the expiration of a license etc. Thus, it is crucial to keep persevering, keep persisting and keep positive. Providing an alternative is the next step. 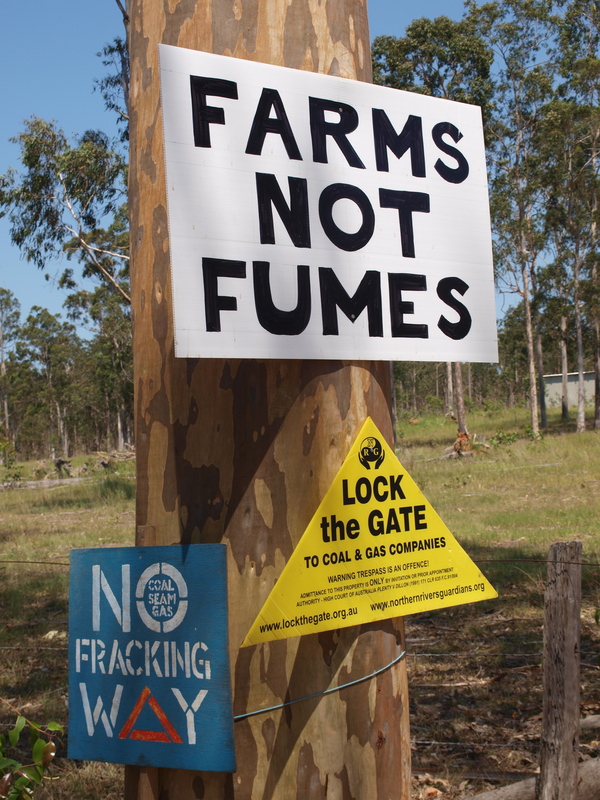 If the claim that CSG is crucial to provide energy security for the people of NSW, we need to develop an alternative. Where should a solar thermal plant go? What will it cost? How many houses will benefit from it? If we can answer questions like this, we can create an alternative, we can be part of a wider, community endorsed solution. 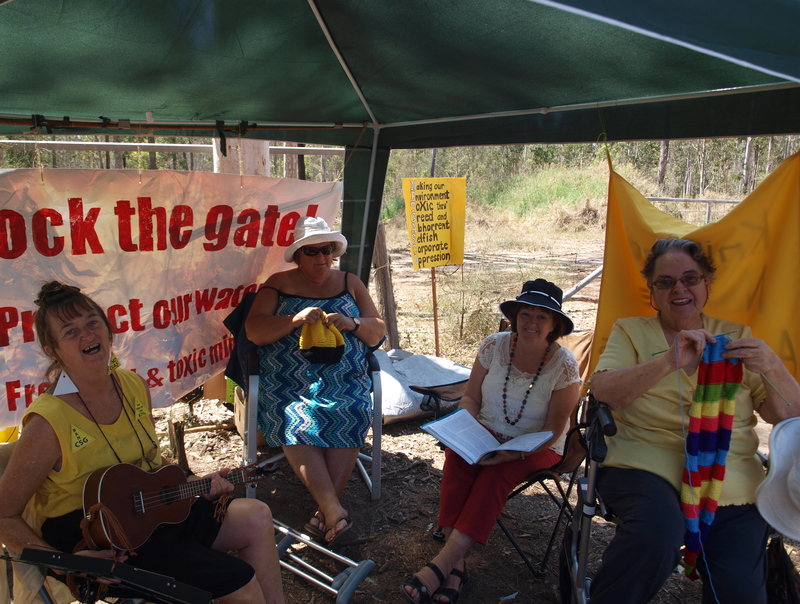 Recently I had the privilege to share my support for the ongoing anti-CSG movement with the protestors at Glenugie. It was striking to see how ‘local’ the level of support was. Traditionally, many environmental blockades operated with little local support- in fact, usually with local hostility. This is what has galvanised this powerful movement. Unlike the potential to disagree about the value of trees and forests, there is no disagreement about the value of agricultural land, clean water and a viable tourist industry. On Sunday, communities crossing three council boundaries proudly declared themselves to be gas field free- over 96% of over 1000 residents surveyed, supported being gas field free! Trials begin at Grafton Local Court House from 9am, February 11th, 2013. If you wish to show your support to mourn the land at Glenugie and support, with respect, those charged protecting it, you may wish to attend. 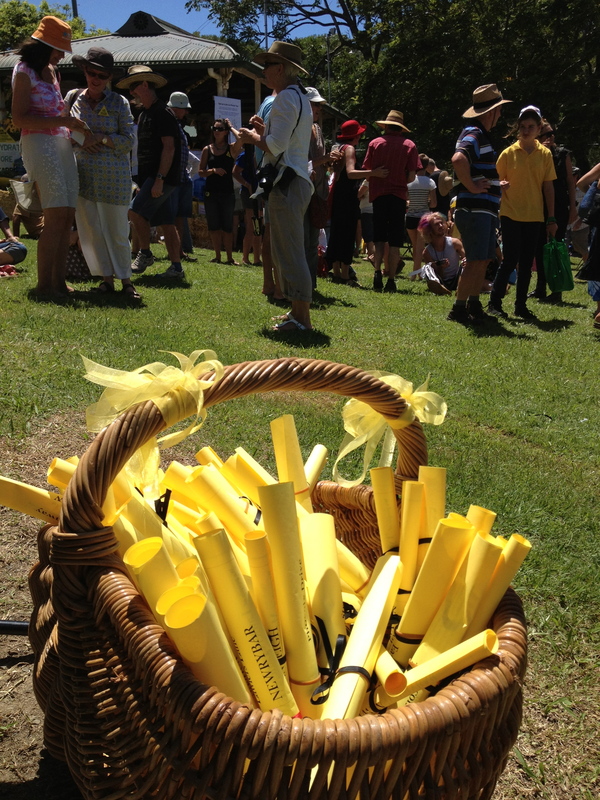 Bangalow: CSG public meeting – 6.00pm Tuesday Feb 12th at A&I Hall, Bangalow. 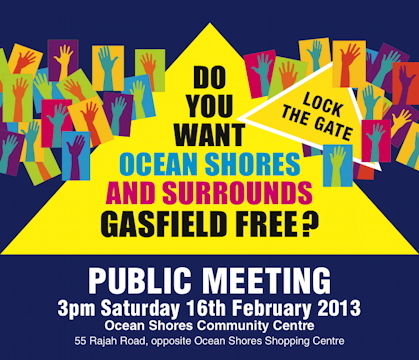 Ocean Shores: 3pm SAT 16th February, 2013, Ocean Shores Community Centre. Byron Bay: 2pm-5pm SAT 23 February, 2013, Byron Bay Sports & Cultural Complex. Police have this morning arrested one indigenous elder and another Githabul traditional owner at the Doubtful Creek blockade of Metgasco coal seam gas operations near Kyogle. There is a massive show of police force at the site with forty five officers currently in attendance, ambulance services, two random breath testing units, two police rescue trucks and tow trucks on site. In addition, in an extraordinary perversion of their proper role, a NSW Rural Fire Service field kitchen is on-site providing police catering. Yesterday, the government formally ‘closed’ the state forest adjoining the drilling site to the public under the NSW Forestry Regulation 2012. There are currently over one hundred people at the protest site and numbers are swelling rapidly. “There are shades of Queensland in the 1980s here today, as police have used minor public order offences to arrest two Indigenous traditional owners, including a local elder Uncle Kevin” said Boudicca Cerese, spokesperson for CSG Free Northern Rivers. “One of the Githabul men was arrested for preparing ochre as a precursor to a ceremony which the group was planning to conduct on their country. “This is a disgraceful display by the O’Farrell Government – using such a massive show of force and trumped up charges to try to intimidate the local community and in the process showing appalling disrespect to the local traditional owners. 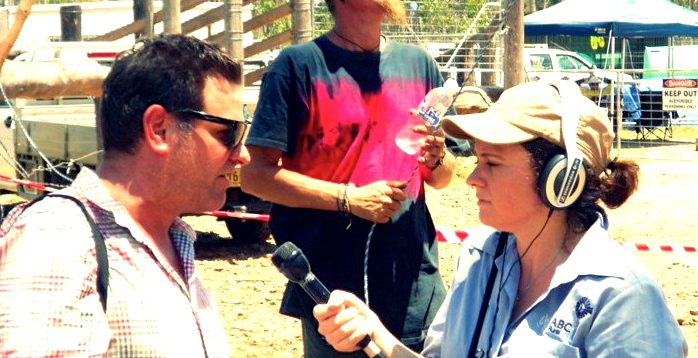 “It is an extraordinary politicisation of the Rural Fire Service getting them to assist the police in this situation – they are supposed to protect communities in emergencies, not to subjugate communities who are defending their country from a gas invasion” said Richard Deem from Kyogle Group Against Gas. “Some of the Rural Fire Service volunteers are visibly distressed and it seems that there may be impending resignations as a result of their involvement in this action”. “We are witnessing the fracturing of rural communities that goes hand in hand with these mining activities. 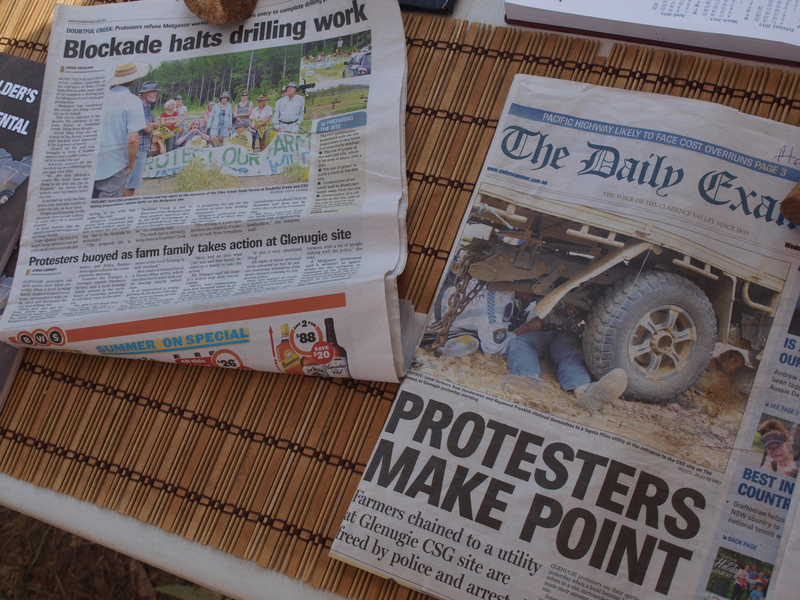 “This is an overt display of force by the NSW Government with the police acting as private security forces for Metgasco in direct opposition to the wishes of the local community who have voted overwhelmingly against coal seam gas mining in the region” he said.